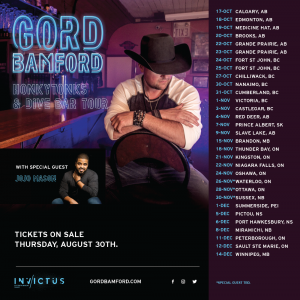 TORONTO, ON – Today, Platinum-selling Sony Music Entertainment Canada recording artist Gord Bamford, announced he is returning to his performing roots with the Honkytonks & Dive Bar Tour. Beginning in Calgary, AB on October 17the tour will hit 29 Canadian cities from coast to coast, giving fans the chance to see one of Canada’s biggest Country music superstars in an intimate setting, at their favourite local bars and honkytonks. Bamford‘s current single, “Dive Bar”, from his latest album Neon Smoke is racing up the radio charts and into the Top 10. The 3-time CCMA Male Artist of the Yea collaborated with distinguished songwriter/producer Phil O’Donnell (Blake Shelton, Tyler Farr, George Strait) on the album, which has also seen the release of the singles “Livin’ On Summertime”, “Ain’t It Grand” – a collaboration with Blue Rodeo’s Jim Cuddy, and the Top 10 Canadian country radio hit “Neon Smoke”. Bamford is one of the most awarded artists in Canadian country music history. He has received 24 Canadian Country Music Association (CCMA) Awards including Album of the Year, Single of the Year and Male Artist of the Year wins, multi Canadian JUNO Award nominations, is the two-time winner (2013/2015) of Nashville’s Country Music Association CMA Global Country Artist Award, with 25 Top 10 singles in Canada including the #1 smash hit “When Your Lips Are So Close”. Bamford has spent the better part of 20 years honing his craft and perfecting his sound, with his eighth studio album, Neon Smoke, becoming a fan favourite since its release earlier this year. Supporting Bamford for 28 dates will be rising star JoJo Mason. With four Top 20 singles under his belt, the SiriusXM “Rising Star” Award nominee has rocketed into the charts and recently released his highly anticipated debut album Both Sides Of The Bar, with his latest single “Something to Wrap My Heart Around” reaching #8 on the Canadian Country charts. 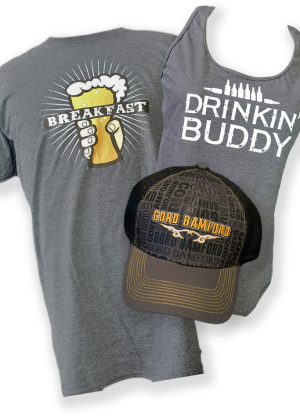 Shop the Gord Bamford store and get all of your favourite gear from shirts to albums and so much more! Game time with this Babe ! @GoldenKnights @SanJoseSharks whose takin it? Thanks to our friends @boosterjuice for the Tix! !